Stall No. 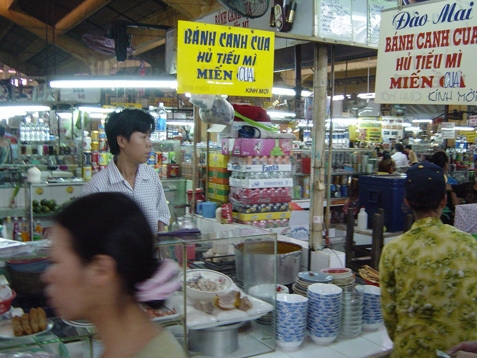 1156 on Ben Thanh market serves up three lunchtime dishes, Banh canh cua (Thick noodle crab soup), Hu tieu (Pork noodle soup) and Mien cua (Translucent noodle crab soup) and is located on the periphery of this 48 stall food market in District 1. 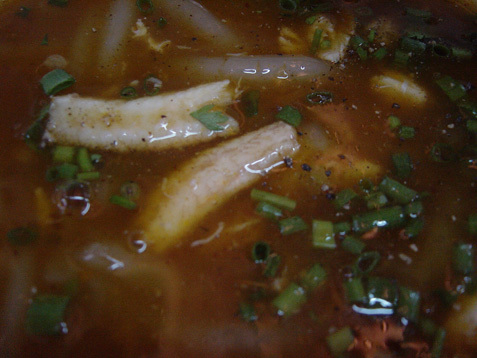 I plumped for a blazin’ chili fuelled Banh canh cua. The slog for the chef with this dish is in the making of the thick rice noodles. These are individually hand rolled, lightly covered in flour and thrown into the pot for a couple of minutes before serving. The flour helps thicken the soup giving it an almost gelatinous quality. As Banh canh cua goes this offering is pretty bland. A broth-boost from the side dish chockfull with sliced lemons, a pot of freshly ground chilies and soy sauce is needed to give it any kind of oomph. The crabmeat is pre-cooked and thrown in at the last minute, as is a paltry prawn together with a handful of finely chopped spring onions. I like my Banh canh cua with a healthy show of straw mushrooms and this soup stall came up mushroom-less. As for their single prawn policy, why bother? If you’re gonna make this a prawn party, loosen up and get liberal with the crustaceans, babe. Tightarsed servings and pathetic solo prawn efforts just look lazy, but for 8,000VD a pop I’m not complaining too much. It’s worth persevering on this food market. Don’t let the aggressive arm grabbing and shouting from the stall touts put you off. Shut out the background noise, focus on the food and get stuck in. This actually looks really good. Was it not good because it didn't have enough crab in it? Or was the whole thing thrown off by the broth? Yup it does look good doesn't it - but, you're right, it was the broth and lack of mushies more than anything. I've had this cooked for me at home before and I know how much work goes into it. This one was just fine, nothing more. Tai Buu Paris Bakery in Santa Ana, Ca has the best banh canh cua, hands down. 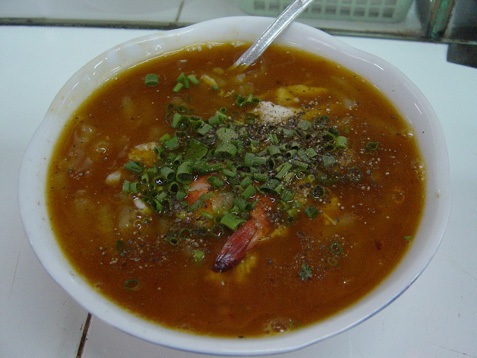 The BANH CANH CUA does not look good, since i know what's the best BANH CANH CUA should look like !!! There's a street stall near my house (near Hai Ba Trung) that has the best BANH CANH CUA !!! I mean they only open from 12h00 to 6h00, and if you come late, you' won't get any food left !!! It's in this small street called Nguyen Huu Cau, easy to regconize the place cause the street is short and it's the only street foodcourt that has a lot of people attending !!! Good luck !! !